2 vendors have this plant for sale.52 members have or want this plant for trade. I inherited these plants when I lived in Grangeville ID, early 1990's. Love them. Now I raise them in Greensboro AL, 2009 and present. The sun in AL is a lot hotter say 20 degrees hotter. I try to give them a little shade by using a ceramic plate, clay brown colored,stuck in the ground half way, facing west to block the heat from the sun. In winter I cover them up 90% with pine straw to help shield the cold kind of like a bird nest, the top is lightly strewn with straw also. 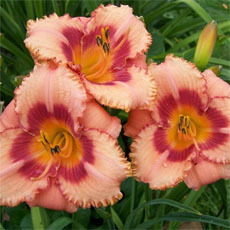 They love well drained soil and I water them once or twice a week in the summer, heat purposes. 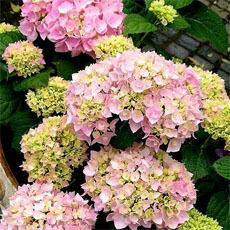 And water them in the winter when it ain't too cold and too stave off dehydration from the cold above freezing temps. They produce chicks all the time. Save your biggest two to be the hens and plant them in ... read moretwos or threes. When one is producing chicks no matter what the size move her to hen status and make sure she is one of the 3 when you transplant them. Make sure if you have them in pots they drain well as they will drown if left in water that might build up after a rain or the pot plugs up. If you grow them long enough you will actually see why they are called "Hens and Chicks!" There are many species of sempervivum, and many cultivars and hybrids. They vary in foliage color, in size, and in leaf shape, but with few exceptions it's almost impossible to identify a cultivar by inspecting a plant. 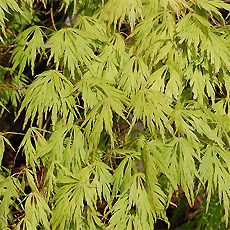 Foliage color also varies with season and cultural conditions. These are alpine plants that grow best in the north and suffer in hot weather. Excellent drainage is especially important in winter and in hot southern summers. Allan Armitage gives their southernmost limit as Z7 in eastern N. America, though I suspect that may be too conservative. I live in Florida. I am not sure how to plant these in full sun and at the same time prevent them from receiving the daily watering from p.m. showers.Can anyone advise me other than planting in containers? Can I put hensχcks in my tree frog tank??? The plants that I have inside are beginning to grow roots. Even though it's only winter, they are still growing. The ones outside are huge! had a whole window box of them. i cant wait till it flowers! MY HEN AND CHICKS ARE GROWING GREAT IN A STRAWBERRY JAR. THE 'HENS' WILL GET VERY LARGE IF THE CHICKS ARE PULLED OFF AND PLANTED ELSEWHERE, OR GIVEN AWAY. I LEAVE MY JAR OF HEN AND CHICKS OUTDOORS ALL YEAR AROUND ON A COVERED PORCH. Hens and Chicks are just the cutest, easiest little plants you ever could find. I have mine growing in pockets of soil in rock piles. They fill in their spaces beautifully. Since they're so small, the rock piles help to elevate them a little so you can admire them more. 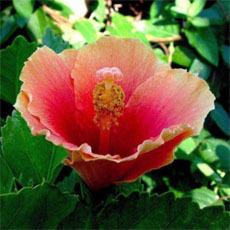 There are hundreds of cultivars available. There are big ones, little ones, purple ones, gray ones, spider-webby ones, round ones, some with their chicks on long stolons, etc., etc. 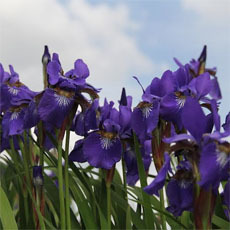 This is a small, easy to grow attractive plant suitable for small spaces. It takes over whatever small space you leave for it and blooms once a year. 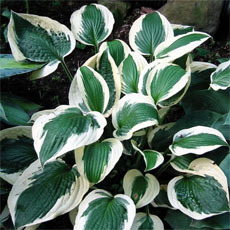 This plant requires little care outside of making sure it has a sunny spot away from weeds and is superb for borders. One plant that will always find a place in my gardens. I dug some of these up from an ancient graveyard next to our yard; they were decorating the tomb of a sailor who died at sea in the 19th century. Possibly these plants are 100 years old! They decorate my garden now, and while hardy, seem to grow slowly. I think they're pretty and I love the history they represent. Hens and Chicks seems to need very little excuse to thrive. It spreads like wildfire, isn't picky about soil, moisture or light conditions, survives the harshest winters if not remaining green, and spreads. Oh, did I mention it spreads? And it's hard to get rid of once it takes off. It's a pretty plant, beautiful colors, great accent, but I'd never use it in anything but a container after the difficulty I had with a seedling I planted last year. After only two weeks I realized it was going to take over, and so had to yank it. I kept finding little bits of hens and chicks popping up for the rest of the season. I like it, but don't recommend it for any planting that isn't either in a container or a place you want it to spread freely in. I tried these years ago, and killed them with love. I saw them elsewhere in the poorest of soils and as crowded as could be, and decided that was the way to go. I got another start, put them in hard clay and crowded them up. They thrived and multiplied, and I eventually got blooms. The blooms are not showy, but are interesting, and the “hen” dies afterward. Truly a plant that thrives on neglect. This was the very first plant I tried to grow outdoors. 50+ years later I'm still growing them, all from that first clump. I have one large clump I planted in the corner of a raised bed 10 or so years ago, they have migrated away from the bed to the asphalt driveway, in full sun. Only a small corner is actually in soil. Never had one bloom though. If you killed it, it is probably because you watered it. Great little plant for youngsters to start with. This plant overwinters well in Western New York. I have them in a flower garden and the winter snow does not seem to kill it. 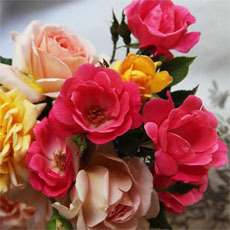 I also grow some as houseplants which spend the summer outside and the winter inside. This is a fun plant to grow. It's so prolific and easy, anyone can do it. It's great to share the "chicks" with friends too. 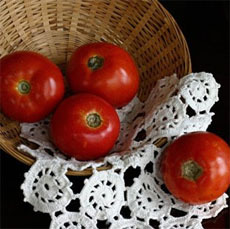 The tips of the leaves turn a deep reddish-brown color in the summer. I have been using purple in color Hens and Chicks.I use them as ground cover around my ferns and other partial shade and full sun areas.Mind you these are the Hens and Chicks that I got from my grandmother before she passed away and she had them from the day I was born,and I am 33. This plant is "AMAZING",I love it. This is a very easy plant to grow. My grandmother gave me a pot of them a few years ago and now I have 6. I've given away two pots to friends. One did well, the other is still recovering back under my care (I think she over-watered the poor thing). This year I happened to notice that they were growing this tall shoots. Thought that was strange, so I looked it up. They are going to bloom? Cool! I have two hens and chicks planted between two rocks, in soil that is barky and drains well. They get mid morning to early afternoon sun. It has been very nice here (Seattle area) lately in the 80's for several weeks. I water them every day. My friends and I have never seen h&c's this tall. They are 2ft plus right now. It looks like they are going to start blooming soon. All our other hens and chicks are just getting wider and only a few inches high. I have been growing hen and chicks for years up here in North Central British Columbia and just love them.They are real easy to grow and spread very quickly. Give them a try you'll love them too! These easy-to-grown plants fill in any space that needs filling.....between rocks, under bushes, in the sun, in the shade, just about anywhere. I moved a huge patch of them from one location to the next, simply setting them on the tilled soil and within two days, new shoots (baby chicks) were creeping from the bigger "hens." I have some very large patches growing and if I were to count each one, they would number over a thousand. Great gound cover with almost no care needed. This plant I got from my grandmother which was her favorite. When she passed-away, all of her 23 grandchildren took home about 100 hen & chicks to plant in their own gardens, so her favorite would live on. I agree with all said prior. I'm in southern Maine and have found that these carefree plants take root in rotting wood and seem to multiply under the snow ! I just wanted to say that growing one type, Jovibarba, is VERY easy from seed! I had a very good percentage germinate, and they went from seed to plant that filled a 4" pot in one summer. No special treatment, just placed seed on soil surface and didn't cover. Our Garden is full of Rocks! Big Rocks that were gathered from the Similkameen River and a nearby Creek. They edge all of the gardens and form a central "Rock Garden" whose focal point is stacked Rock towers. In almost every crevice, growing in nothing but sand, in most cases, are these wonderful evergreen plants. They don't care where they grow or what they grow in or how much water you do or don't give them. This is Very Hot semi-arid desert(Yes, we have it in Canada) with normally Very Cold winters. To grow Big Hens-remove all of the babies. Great fun and perfect for any Hot Arid Climate. 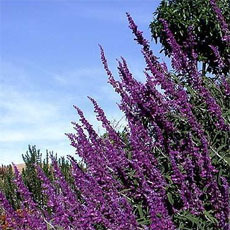 This is one of the most durable and rewarding plants to grow. It produces between 4-12 'chicks' a year so your collection is constantly growing. They bloom once (at the 2-3rd year) and then die...but they have left behind MANY babies in place. To start another plant, remove one chick, leaving just a little of the stem and simply lay it on prepped soil. It should take root and start making chicks of it's own!